BBCanada.com - Saskatchewan, one big beautiful place. There is no denying the fact that Saskatchewan is one big‚ beautiful place. A sweeping 652‚000 square kilometres‚ the province has a geographic opulence that strikes a chord with visitors and has a deep‚ resounding impact on those who call Saskatchewan home. Land and sky are ever-present influences. No matter where you are‚ nature is always in your backyard. Even at the heart of Saskatchewan’s major cities – Regina and Saskatoon – you are still only minutes away from the colossal expanse of fertile land that feeds the world. Overhead‚ dramatic “Living Skies” command attention. Sunsets reveal colours rarely seen. Brilliant sunshine prolongs summer days and warms the chill of winter. 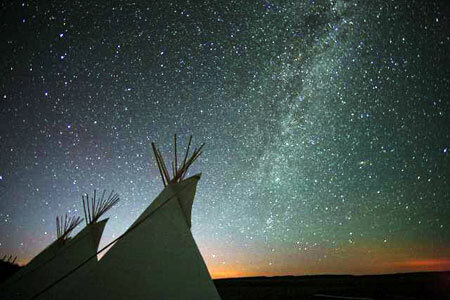 Night skies (some of the darkest in North America) showcase the infinite wonders of the cosmos. These same natural phenomenon – vast openness‚ the mysteries of space‚ nature’s splendour‚ the wax and wane of four distinct and colourful seasons – shape people’s character. They nurture creativity and innovation‚ build resilience and influence pride of place and a profound attachment to this part of the world. 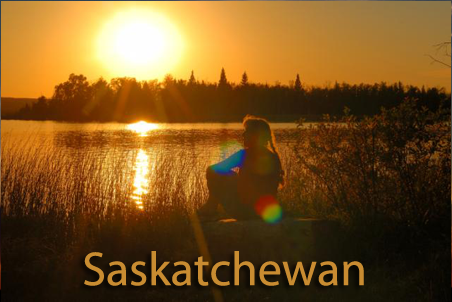 Be assured‚ you are always welcome – you are‚ in fact‚ among friends when you visit Saskatchewan. In no time‚ you are made to feel like part of the community‚ like a member of the family. The sense of community extends province-wide. In a very special way‚ it feels like one big small town. It takes time to really see Saskatchewan‚ partly because every moment‚ every experience is worth savouring. The longer you stay‚ the more memories you will collect. Deciding where to visit can be a challenge. What are your interests? 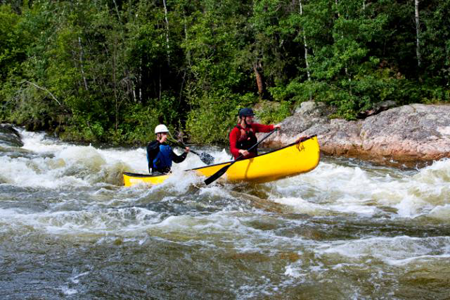 Outdoor adventure seekers and nature enthusiasts are enticed by the thrill of the north with its mighty rivers and nearly 100‚000 freshwater lakes framed by lush boreal forest. There’s nothing quite like canoeing the fast-flowing Churchill River‚ a waterway important to First Nations travel and trade centuries before the arrival of explorers and voyageurs. The route has withstood time and civilization‚ navigating a landscape that remains in its pristine form. Ness Creek Festival‚ near Big River‚ Saskatchewan. The Waskesiu and Area Wilderness Region represents several northern communities and encompasses Prince Albert National Park – a favourite destination to explore backcountry adventures and view wildlife and rare species‚ including Canada’s only free-roaming herd of Plains bison on its historic range. The annual Ness Creek Music Festival‚ which takes place in July near the town of Big River‚ has become a signature event for Saskatchewan. The breathtaking boreal forest setting is a striking backdrop to the impressive performances onstage. The festival is part of a trio of summer events hosted at this site‚ which include Country at the Creek in June and the Northern Lights Bluegrass and Old Tyme Music Festival‚ held each August. Cultural events and festivals‚ along with sport competitions showcase the spirit of communities. They are driven by one of the strongest and most dedicated volunteer corps in all of Canada. These are people who are serious when it comes to throwing a party for guests – serious in that they go above and beyond to do a great job and give visitors every reason to return to Saskatchewan; not so serious in regard to the atmosphere and festivities that take place. For example‚ the 2013 Grey Cup Festival and Championship Game‚ held in Regina‚ was clearly a province-wide celebration and showcase of Saskatchewan hospitality. Did the excitement‚ fervour and unabashed enthusiasm for hosting the celebration contribute to the victory by the home team‚ the Saskatchewan Roughriders? Canadian Football League fans across Canada contend that a Rider game‚ particularly on home turf‚ is an unforgettable experience. There is excitement throughout Regina. Green and white Rider wear is standard attire. Stores and shops decorate accordingly. Homes and front lawns feature creative displays of Rider pride. Watermelons disappear from grocery store shelves‚ becoming wardrobe items for some of the more boisterous supporters of the team. But even opposing fans admit to feeling the warmth and appreciating the hospitality that is extended to everyone in attendance. Night Skies‚ Grasslands National Park. As for those dark skies mentioned earlier‚ Grasslands National Park and Cypress Hills Interprovincial Park‚ both in southwest Saskatchewan‚ are designated dark sky preserves and form one of the largest areas in North America for star gazing. The interesting paradox is that in the dead of night‚ you can see your own shadow‚ cast by the light of the Milky Way. For local flora and fauna‚ the natural cycle of daylight and darkness restores natural behaviours and balances the ecosystem. No matter what part of Saskatchewan you choose to explore‚ no matter how long you decide to stay‚ the essence of this place will make a memorable impression. Chances are you will leave here reflecting on some deep and meaningful issues – the rare patches of natural beauty that still exist in the world‚ the warm and secure feeling of community‚ the delight of forging new friendships and importance of taking time to relax‚ breathe‚ seek solace and listen to the sound of your own heart beating. To find out more about the wonderful experiences awaiting you in Saskatchewan, get your free copies of Tourism Saskatchewan’s travel guides, or receive trip planning assistance, visit TourismSaskatchewan.com or call 1-877-2ESCAPE (toll-free), or connect with us @Saskatchewan on Twitter. Explore these unique and charming Saskatchewan B & B’s.